Ethan's great new craze is driving. He either particularly likes Daddy's little Subaru R1 or he particularly likes driving with Daddy. Today Mummy is feeling under the weather so Daddy told Ethan that he was going to drive with Daddy. You cannot imagine the look of glee dripping from his face. I wish we all had that same expectant joy when we are about to spend time with our Abba Father! So here we are at free parking outside Sembawang Shopping Centre, after a rainy drive during which Ethan kept telling me that HE wanted to drive. Daddy promised so Daddy is delivering - letting Ethan enjoy one of his favourite activities. Whether it is being with Daddy or getting to be like Daddy he just soaks it all up! 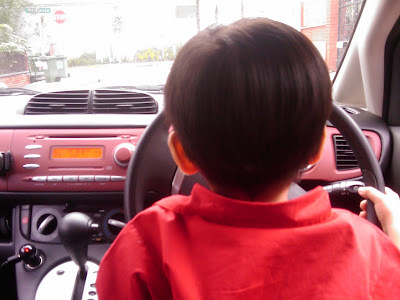 He will probably remember this time "driving" more than any other activity we do at Sembawang!